Professional, road-ready hardware at an unbeatable price. Equipped with lots of individual components, the 4000 Series is easy to set up, adjust and tear down. The MBS-4000 features a quick release system, which eases changes and setups. Its boom features a retractable, knurled boom arm that can be set straight or as a boom arm to enhance your possibilities. The gearless cymbal tilter can be infinitely adjusted at any angle. The new lever screw adjusts the tilter with stronger force and can be moved out of the cymbals way independently. The sturdy two-segment tube clamp provides super strong clamping force for any stage or studio situation. The Tom Arms feature flexible open ball clamp and short hex rods, which enable easier adjustment and rotation motion. 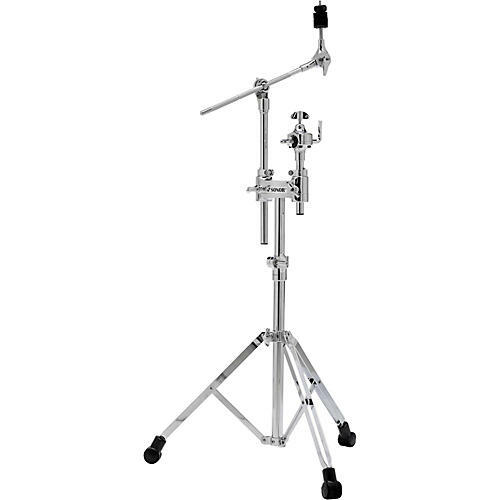 Its wing screw/ wing nuts design enforces grip on every connection (except the cymbal tilter) and the rubber feet enhance the stability and ground contact of the stands. Holds one tom and one cymbal.